The Eternal Bliss brings out clearly the philosophy of one's Ideal of life as visualized by Guru Amar Das and enjoined upon all Sikhs, in attaining Eternal Bliss in life in the form of a unison with the Lord. 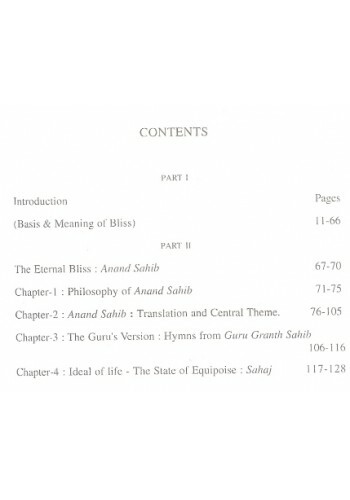 This book on "The Eternal Bliss" or "The Ideal of Life) has been written with the explicit idea of developing the Sikh thought on an "Ideal of life" as Guru Arjan Dev has remarked. Which means I seek not worldly empires or even salvation but the Lord's True Love and a place at His lotus feet, "which Guru Amar Das has brought out beautifully in Anand Sahib shown in Part II which is to be read daily as a part of Morning Sikh Prayers. No function can be considered complete, whether of joy or sorrow (birth, marriage or death) if it is not accompained by a recitation of Anand Sahib before the Ardas (Prayer) Thus the Ideal of life is the attainment of Eternal Bliss. 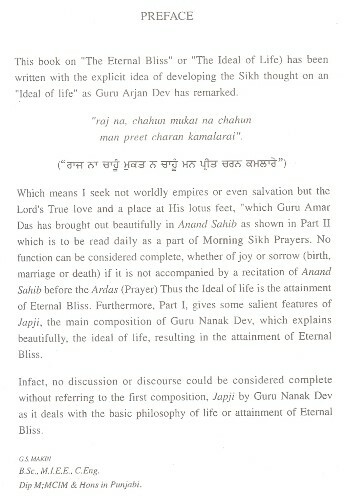 Furthermore, Part I, gives some salient features of Japji, the main composition of Guru Nanak Dev, which explains beautifully, the ideal of life, resulting in the attainment of Eternal Bliss. Infact, no discussion or discourse could be considered complete without referring to the first composition, Japji by Guru Nanak Dev as it deals with the basic philosophy of life or attainment of Eternal Bliss. This is an experience, explained by the Guru Himself, having realized the bliss of attaining the Lord, which the Sikhs have been directed to follow. Preface To 'Sunder Gutka (Gurmukhi Roman) Gutka' Sunder Gutka is a collection of Banis .. Preface Of The Book 'Guru Nanak Dev and His Teachings' By Prof. Sahib Singh Life history of Guru ..
Table Of Contents For 'The Four Pillars Of Sikhism' Book By Gurbachan Singh Makin ..
Summary of 'Sacred Nitnem' By Harbans Singh Doabia Most Sacred and Divine Hymns ( Gurbani) ..
Frontcover of the Book 'Philosophy of Sikh Gurus' By Gurbachan Singh Makin The Book on "Philo.. 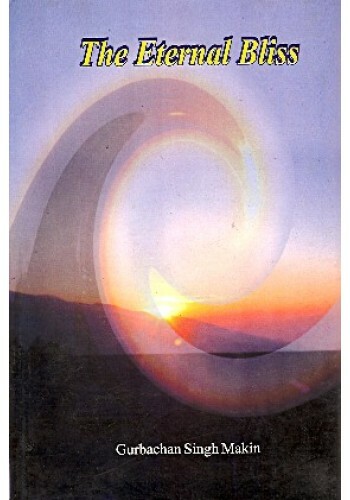 Preface To Book 'Japuji A Gate Way to Liberation' By Dr. Harjinder Singh Majhail Japuji has.. 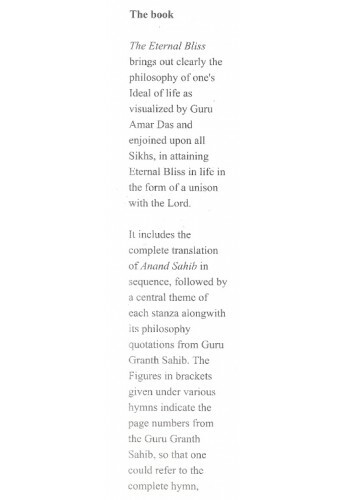 Preface Of The Book 'Eternal Glory Of Guru Arjan Partakh Har, Sri Guru Tegh Bahadur Sahib and Gur..
Understanding Anand Sahib - The Songs Of Bliss - Book by Satjit Wadva ..